Collaboratively re-purposing content of published blog posts, i.e., Business Intangible Asset Blog…is a professionally impressive, dignified, and ‘message relevant’ marketing strategy, i.e., converting (blog post) readers to prospective clients to sustainable clients. bring clarity to the distinctive needs and challenges common to the rapidly growing number of businesses, in all sectors, which are ‘intangible asset intensive and dependent’. develop and bank essential – valuable relationship capital which elevates reader receptivity to conversion from prospective to actual clients. moderate vs. elevate a firm’s reputation and brand. often, are absent the prowess of relationship capital. Too, applying – reliance on FUD factors (i.e., fear, uncertainty, doubt) as the primary means for persuading prospective client’s ‘buy rationale’…can translate to the experienced as subjective, cherry picked, and choreographed messaging. FUD factors, by design, are intended to…influence targets’ base emotions, insofar as assuming immediate action is essential. When, in point of fact, prudent decision making that buys long term intellectual, structural, and relationship capital are the important realities for professional service firms. is professionally impressive and dignified, that delivers finely tuned message relevance to convert (blog post) readers to prospective clients and to sustainable – real clients. is a relevant foundation – prelude to developing and executing ‘inbound marketing’ initiatives. and, perhaps most importantly, contribute to recognizing the lucrative – competitive relevance of coordinating practice area expertise to deliver intangible asset services. 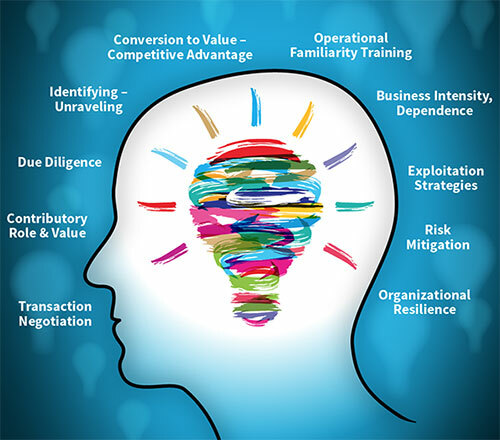 The ‘Business Intangible Asset Blog’ is an authoritative resource… consisting of 650+ (long form) published posts whose content can be collaboratively and quickly extracted and re-purposed to deliver relevant and thought provoking insights to business leadership readers. addressing current – prospective clients near term and strategic needs, riswhich they will inevitably experience. constitutes a legitimate, learned, and ethical means to address current – prospective clients nuanced – sector specific business interests and financial-competitive ‘pain points’. is respectfully nurturing insofar as integrating language that respectfully appeals to – influences readers – clients decisions based upon relationship capital.